The chewing flavor starts with the natural chicken meat flavor, with a slightly increased smokiness and saltiness, and touches of seasonings, primarily black pepper. For being marketed as a chicken jerky, it certainly offers up the familiar and favorite poultry pleasantness of chicken, but in a jerky form factor. It has the chicken meat flavor, but also the chewing texture as well, albeit in a more dry, chewy jerky style. 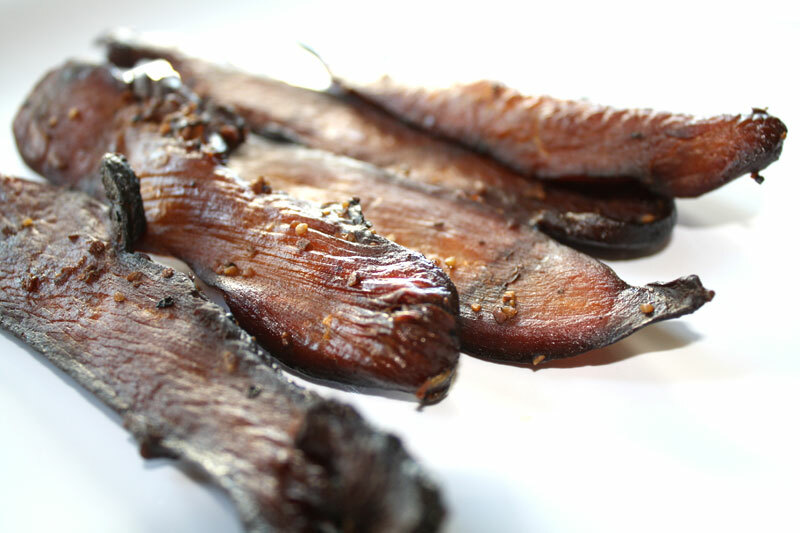 The flavors that seem to dominate this jerky starts with the smokiness and light saltiness, along with the natural chicken meat flavors, and then touched with some spicy black pepper. I also want to say there's a faint bit of sweet in this, and hints of garlic. The level of saltiness seems light to moderate in intensity. Overall, it's a flavorful chicken jerky but not spicy aside from a touch of black pepper. For the most part, it's the combination of smokiness and saltiness with the natural flavors of chicken that I taste, and then graced with some seasonings. These are slices of whole meat, sliced into strips of four to six inches in length, and sliced thick. I'm not certain, but this appears to be sliced chicken tenderloin and breast meat. The chewing texture starts off feeling stiff, but easily breaks apart and breaks down with some light chewing. It has a dry, almost crumbly texture, and quickly renders into a soft mass. At that point, it has meaty texture very much resembling chicken meat, but a little more dry. 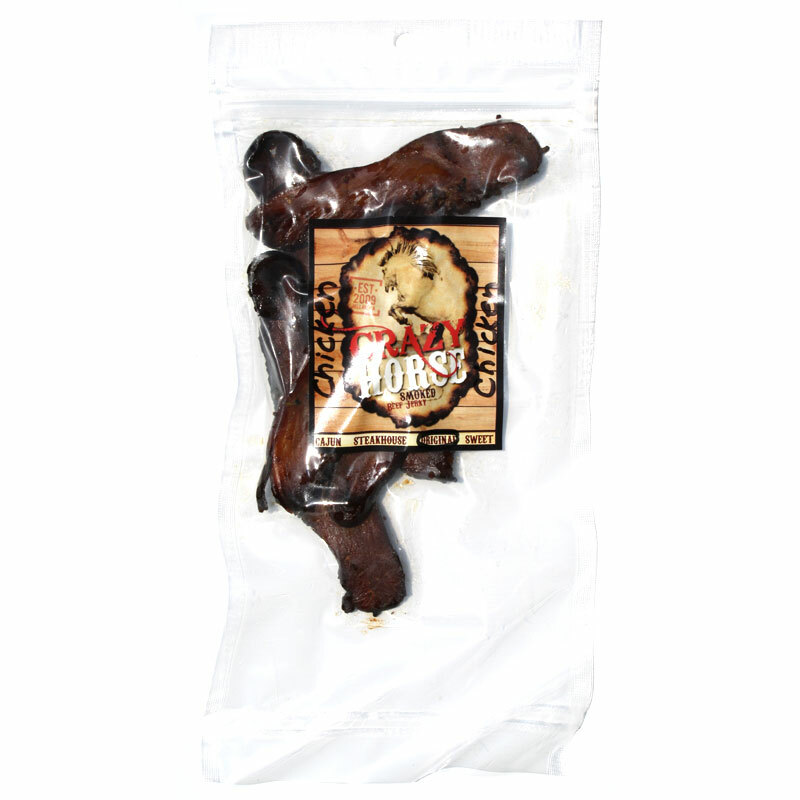 This Original Chicken Jerky from Crazy Horse Jerky belts out the same signature real wood smokiness and seasonings that make Crazy Horse Jerky so good, but does it in America's other favorite meat, chicken. What I really liked with this chicken jerky is the large strips of chicken meat, tenderloin and breast meat, compared to the smaller pieces and chunks that I found in other chicken jerky brands. 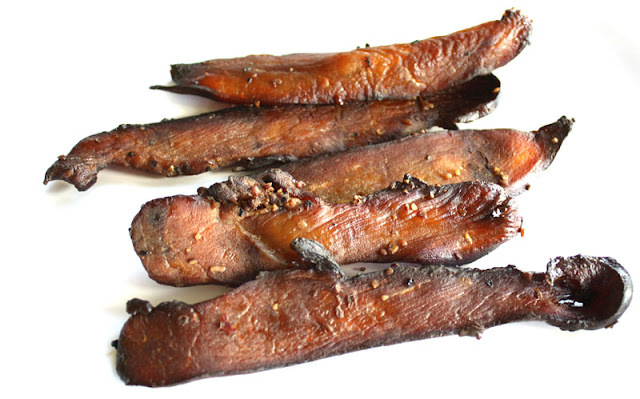 It's easy to chew, but still retains the meaty, chewy, character that makes for good jerky. But it's hard to deny real wood smokiness when combined with the natural flavor of chicken, a real culinary artform in the classic American sense. The touches of seasonings are all that's needed to add some savory into making this a great jerky. My recommended beer pairing, go with a light craft lager, such as the Trumer Pils, or the Samuel Adams Nobel Pils.